I bought these bright pink pants last year- and was a bit nervous about the color, they are so bright! But it turns out, I love wearing them! Truth be told, I feel a bit like a barbie doll when I do. They are just so pink- and so bright- and so attention seeking! With that in mind, I figured my top must be a bit subdued- which is why I chose my off white blazer. I figured a blazer would help my outfit look a bit more professional- and the neutral color is a perfect balance for the bright pants. 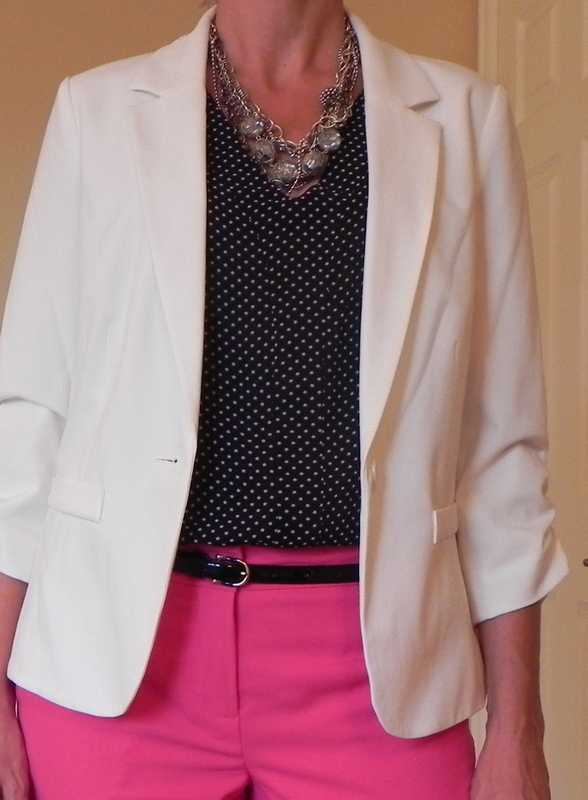 Underneath the blazer, I opted for this cute black and white polka dot top- with a cute V neck. Let me tell you about this top- I bought it at Target (God, I love Target) thinking it was a great piece- but as you can see on the right, paired with the black cropped pants and worn untucked-something didn’t feel right. Part of the problem is the cut- it is a very loose, flowy top- and with these pants the whole outfit is too baggy. A pair of skinny jeans or leggings and it might work. As for the cropped pants– I say this over and over again- but ladies- please don’t wear cropped pants that end mid-calf. It makes your legs look short! Go for the ankle length- much more flattering! Back to the ‘after’ picture. Just to add a bit more polish and complete the look, I added a black skinny belt, a statement necklace and a pair of black wedges. This outfit would be appropriate for work or for a night out on the town (I wore it out to dinner with friends Saturday night). A close up so you can see the detail of this cute top! For another crazy before picture- check out this one- where I had color overload! love the polka dot blouse, it’s great! are these pants even cropped pants? they seem to be normal length that’s pretty much at your ankle and look great. What do you think about tall girls wearing crops? Was wondering if having long legs can let you get away with wearing cropped pants. They are so comfy and good for hot days! Yes, they are cropped- but barely. I am on the average side (5’5″), so on a taller gal these would look more cropped. I definitely think tall ladies can wear cropped- but just be aware of the length- don’t want them to be too short. So excited you’re back, Megan! Love the polka dot top. Thanks! I think it will be a fun piece to have. I’ve been wanting to try polka dots- but have been a bit afraid. These feel very ‘safe’ to me… probably because they are so small!